It's important to keep your braces and teeth properly clean. Otherwise, you may end up with gum disease and decalcification of your teeth! Cleaning teeth in braces isn't hard; it just takes time and patience. When you first get your braces on, brushing and flossing will probably take 10 to 20 minutes. As you get used to your braces and time passes, you'll get faster at it. 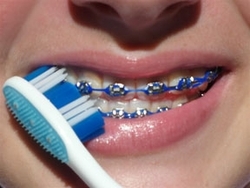 The first few days after you get your braces, your teeth and gums may be very sensitive. It may be extremely difficult to brush and floss properly because of this sensitivity. Just do your best. You may need to take a break from flossing for a few days until the initial pain and sensitivity subside. How often should you brush your teeth? Ideally, after every meal and snack. Of course, that may not be realistic. Just brush as often as you can. In between, swish water in your mouth or just rinse and spit a few times. Make sure that you floss at least once a day. Here are the steps you should take to keep your braces clean. You can find many of the products mentioned in your local drugstore or here at DentaKit.com. Rinse your mouth with water to help dislodge any food particles that may be stuck in your braces. Give it a few really good rinses. Use a dental pick or a spiral inter-proximal brush to dislodge any large visible food particles, and rinse again. Just poke the little brush or dental pick under the arch wire between each bracket. There are a number of dental picks and small spiral brushes available, in different sizes and types. Our favorite dental pick is the Pick-a-Dent, and our favorite inter-promial brushes are the Proxi-Tip, the SulcaBrush, and the Tip-a-Dent. After you dislodge the food particles, rinse with water once or twice. Now you're ready to brush. Put a small amount of toothpaste on your toothbrush. It's better to use a regular “non-whitening” toothpaste; otherwise your exposed teeth could end up whiter than the teeth beneath your brackets! An orthodontic v-trim toothbrush isn't absolutely necessary, but it does help. Brush the brackets on each tooth both up and down and side to side. Angle the toothbrush so that you get underneath the brackets to ensure that all surfaces are clean. Sometimes brushing in a circular motion over each tooth is helpful. If you have an electric toothbrush, follow the manufacturer's instructions for cleaning your braces. Don't forget to brush your molars and your tongue, too! Floss at least once a day. The floss must go underneath the arch wire of each tooth. You need to poke the floss underneath the arch wire, floss the tooth, then remove the floss, and repeat the process on the next tooth. This can get tricky, especially for the back molars. Fortunately, there are several products which can help you. You can use any floss you like with a Floss Threader Needle or the FlossFish tool. Several brands of floss have a built-in stiff end, such as Oral-b Crest Glide Threader Floss. If you want a small flossing tool, Plackers OrthoPick Flosser is an excellent product. No matter what type of floss you use, just go slowly and be patient with yourself. Flossing braces is one of the most frustrating parts of the entire process, especially at first. As time passes you'll get better and faster at flossing. Consider an Oral Irrigator, especially if you can't floss well. Oral irrigators don't take the place of flossing, but you can add irrigation to your routine to ensure that your teeth and gums stay super healthy. We sell a great oral irrigator made by Oral Breeze which hooks up to your bathroom faucet. When you have braces, consider getting your teeth professionally cleaned by your dentist more often. When I had my braces, I got four cleanings per year instead of the usual two cleanings. Cleaning your teeth more often will ensure that you don't get any “bad surprises” when your braces come off!